Max Subler says the people involved in his care gave him a warm impression of Reid Health. A well-timed joke eased his nerves in the heart cath lab. A unit nurse made him so comfortable “she could have been a daughter” – and even returned on her own time to give him a hug before he was discharged. These unexpected personal touches in addition to the special procedure that fixed an irregular heartbeat gave Max Subler a lasting and warm impression of Reid Health. “I’ve never been in a hospital like Reid” said Subler. He was sitting relaxed in the kitchen of his home in the Dawn community north of Greenville in Darke County Ohio several months after a cardiac ablation by Xinqiang Han M.D. straightened out his heart rhythm. The heart problem was only uncovered when he was seeing another specialist for a completely different issue Subler said. 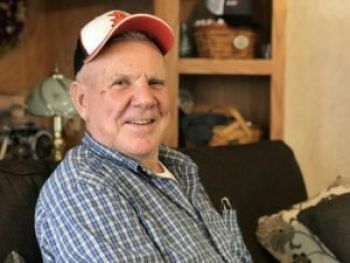 He had some shortness of breath from it but assumed that was from a COPD diagnosis he already knew about — possibly related to a smoking habit kicked more than 20 years ago. Energy is important for the active Subler who will be 80 this year. Though semi-retired he stays quite busy. He has worked for Ansonia schools for more than 40 years and still works 20 hours a week. He clearly enjoys people with a sense of humor noting that an attendant in the cath lab broke the ice by joking around with him and that’s what eased his fears before his heart procedure. Subler and his wife Linda also speak highly of Henry Chong M.D. the heart specialist they both now see at Bethel Cardiology in the Reid Health Greenville complex. Linda Subler has been Dr. Chong’s patient much longer than her husband. For Max Subler great medical care — combined with the warmth of others who took care of him — made his Reid Health experience uniquely memorable.